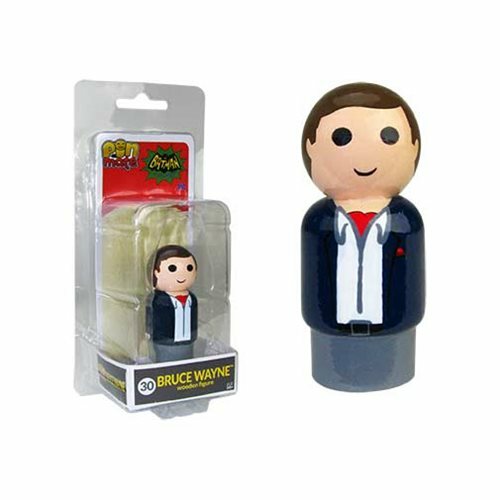 First-ever Pin Mate™ celebrating BRUCE WAYNE™ from the classic live-action TV series. One-of-a-kind, retro-styled, miniature wooden figure. Number 30 in the series for true collectibility. The Batman Classic TV Series Bruce Wayne Pin Mate™ from Bif Bang Pow! is a small wooden figure, designed in a retro-style that features stunning 360-degree artwork that includes hand-painted details alongside limited decal graphics. Proving some of the best things come in small packages, the Batman Classic TV Series Bruce Wayne Pin Mate™ is created in a 2-inch size. Uniquely numbered on the bottom of the figure (as well as on the packaging), the Batman Classic TV Series Bruce Wayne Pin Mate™ is number 30 in the series. Ages 14 and up. This item is not a toy. Batman Armored Pin Mate Wooden Figure - Toy Fair 2016 Excl. Justice League Pin Mate Wooden Figure Set of 3 - Con. Exc.